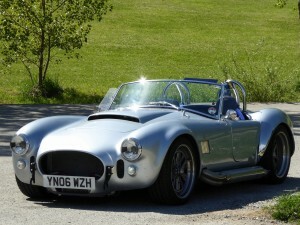 The Dax Sporting Club is dedicated to owners and enthusiasts of the iconic Seven and Cobra style sports cars. The Dax Rush is a lightweight two seater sports car with a multi-tube triangulated space frame chassis, front engine, rear wheel drive configuration with two suspension systems – De Dion and IRS. 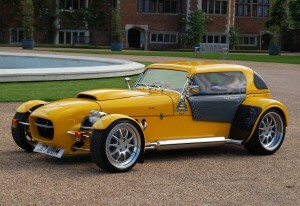 The Rush has always offered a more muscle car stance and appearance to the classic Seven style sports car and has recently undergone a unique innovation and concept design at the hands of British concept designer and ex Lola race car engineer Rich Howlett as his design evolves this classic style open top sports car into a Concours winning Hardtop Coupé. Engine installations for the marque range from the humble 2.0 Litre variants through to the iconic Cosworth Turbo and Rover 3.9 & 4.6 Litre V8’s with trademark stainless steel side pipes, split rim alloys, 255 low profile tyres and Cosworth brakes for that all important stopping power. The Dax Rush is the true muscle car amongst the Seven style stable. The Dax Cobra 427 offers the same iconic muscle car stance and state of the art De Dion or IRS technical specifications with a Patent Camber Compensation & Anti Roll System for competition use. This hugely charismatic sports car will accommodate most American V8 or Jaguar V12 engines and with its low, wide presence, sumptuous leather interior and trademark soundtrack, whatever your preference, whether road or race you know you are in the presence of a true icon and technical work of art.